Lens Description: The Rodenstock 45mm f/4.5 Apo-Grandagon Lens is a professional wide angle lens specifically for the 6x9 format, providing an angle of view on 6x9 which is similar to a 19mm lens in the 35mm format. 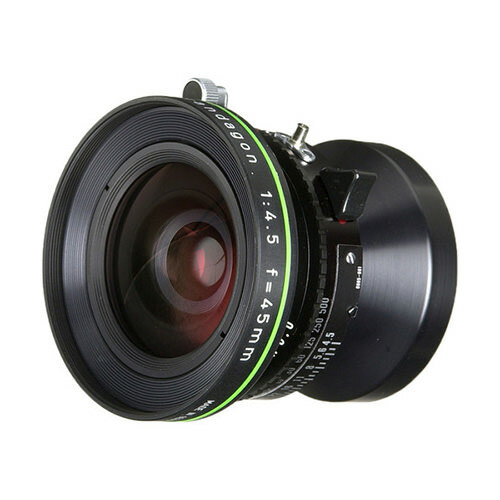 The Apo-Grandagon is the ideal 'space expander' lens when you're trying to capture an expansive area of cramped space. The 110° angle of coverage permits 15mm of all-direction shift on the 6x9 format, particularly beneficial when capturing a building from ground level. The Apo-Grandagon series use ED (Extra-Low Dispersion) glass elements for truly apochromatic color correction and superior edge delineation. This lens is recommended for use between f/8 and f/11 apertures, which helps shorten the exposure times.